When most people think of seaweed they think of a slimy, rubbery plant. Well I can’t totally dismiss this fact but it’s not as bad as you would think especially when you see the health benefits of how amazing seaweed is for your body. * Replenishes quite a few deficiencies in the body. * Seaweed also helps in reducing birth defects and protects the child from having congenital cardiovascular diseases. * Regulates the thyroid metabolism as it is the richest source of iodine. * It controls obesity and dissolves fat wastes through the skin by increasing perspiration in order to restore a youthful texture. * Since it contains the vital nutrients, it helps in maintaining a healthy diet regime. * It consists of lignans (a type of phytoestrogen) which has anti-cancer properties. * Seaweeds also play a very important role in brain development. * Magnesium which acts as an anti-inflammatory substance is also present in high amounts in seaweeds. * It helps in reducing menopause symptoms like hot flashes and fatigue. * Science has proved that these weeds contain a large amount of alginic acid which has the ability to bind to the unwanted heavy metals in the intestine. This helps in detoxification of the body from such toxic metals. * One of the most important seaweed health benefits is that it increases the body metabolism. A great way to consume seaweed you’ll find is in Japanese sushi restaurants. Seaweed salad is a great way to get the health benefits or you can just go for the sushi which has a seaweed wrap in most rolls. The reason why seaweed is so great is that it is organic. When most people ask what is the easiest way to lose weight I always tell them the same advice. Organic fruits and vegetables is the way to go. 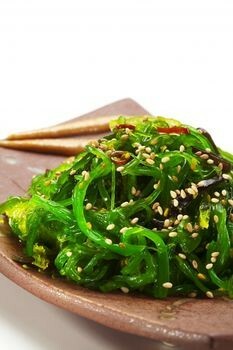 Even though seaweed is an algae it is still incredibly high on the health scale. Leave me some comments and show me you’re still alive!